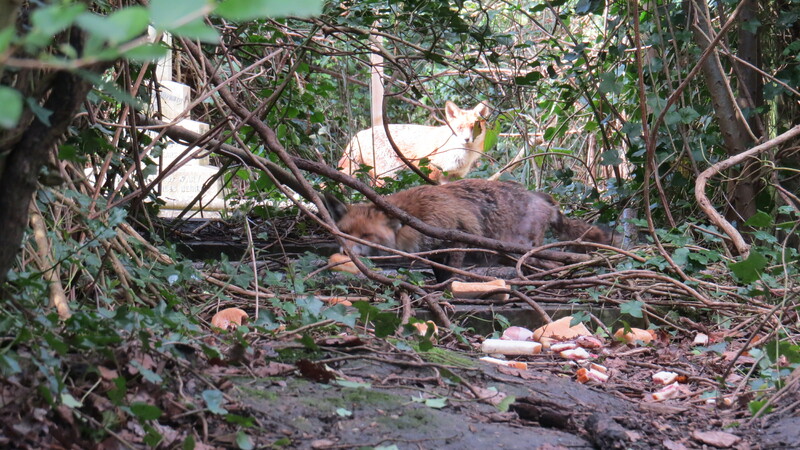 Dear Readers, last time I wrote about my adventures with foxes in St Pancras and Islington cemetery, I had just discovered that B, a lovely lady who feeds the feral cats in the cemetery, also regularly fed the foxes. This was great news, because it meant that I knew exactly where to find them, and where to drop my jam sandwiches with their homeopathic mange remedy. And indeed, between three and four thirty p.m. on any afternoon, you can spot the two foxes waiting for their high tea. The fox at the front is the one that I’m trying to treat. 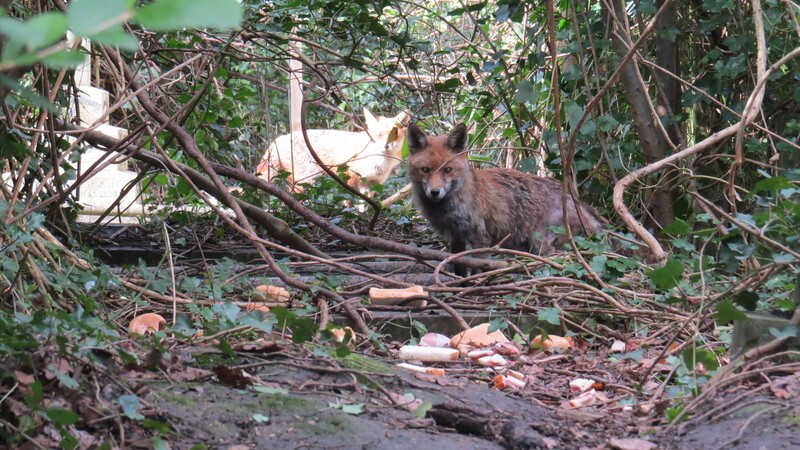 What intrigues me is that the two foxes play and nuzzle one another, and are not particularly competitive – could they be mates, or siblings? B leaves a variety of foodstuffs that the foxes probably shouldn’t have (doughnuts not being part of a natural diet) but while I was away for a family funeral last week she liberally doused them in mange medicine for me, so I’m not about to complain. Plus, she also leaves them dog food and dog biscuits, so it isn’t dessert all the way. 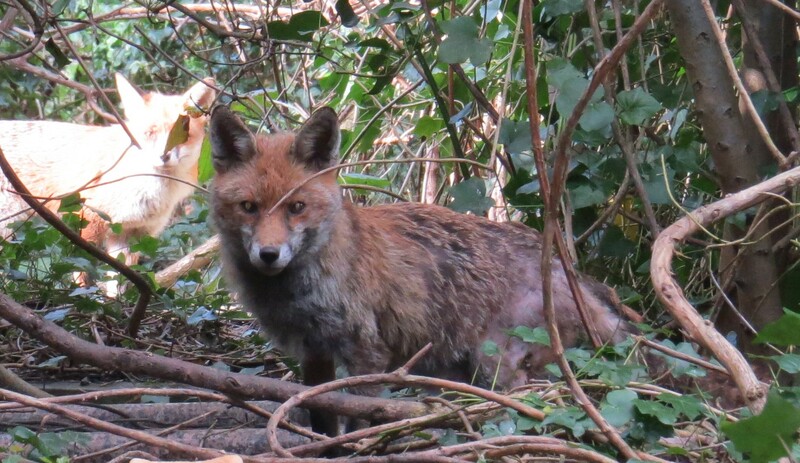 It is clear that the fox with mange still has mange, but, without wanting to be too optimistic, I do think it’s a bit better, and the picture above was taken almost ten days ago, before I found exactly where to leave the medicated food. 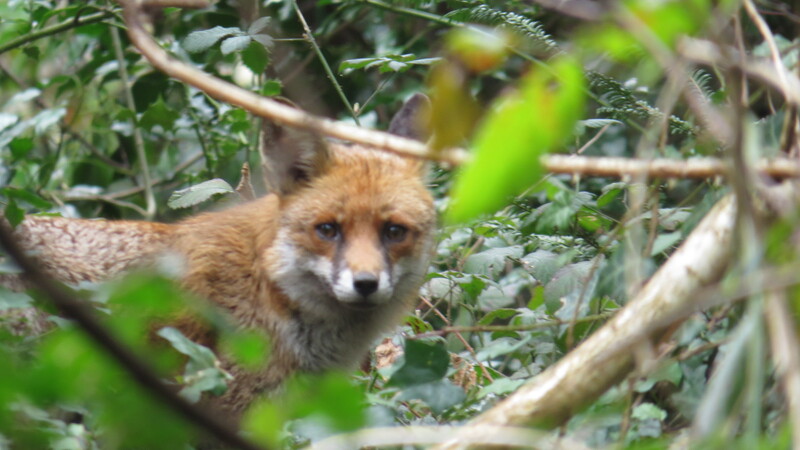 The Dog Unit man told me yesterday that he thought that there had been an improvement in the fox’s condition, and he isn’t a sentimental chap so I hope he’s right. Is it my imagination, or does the fox’s back end seem a bit furrier, as if some of the fur is growing back? The animal certainly seems a bit brighter. Only time will tell, but I have everything crossed. It’s fair to say that the fox who doesn’t have mange has grown fairly used to me. 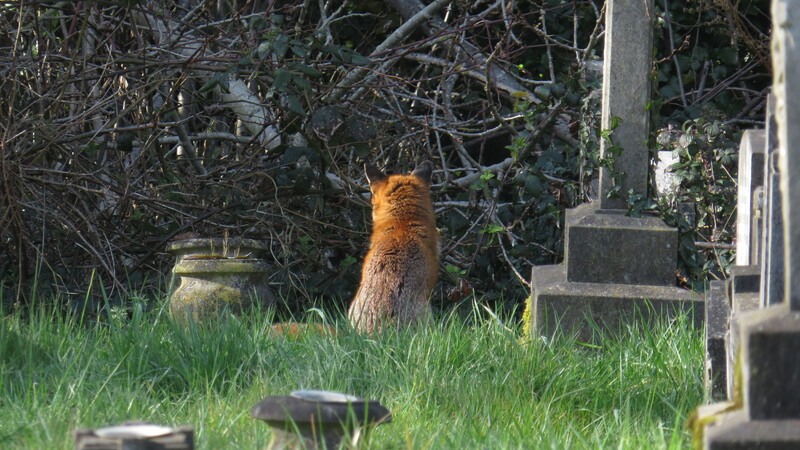 He or she often shadows me as I walk around the cemetery, in the hope that I’ve got yet more sandwiches, I suspect. 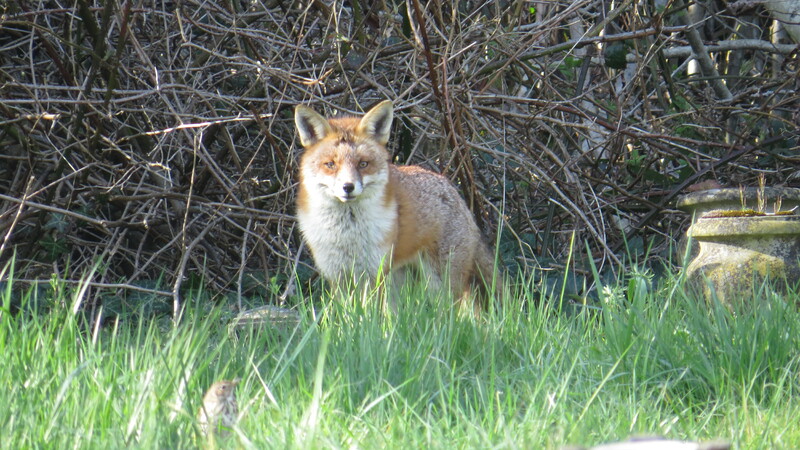 The fox always keeps the same distance between us, but if I stop, he or she will often just sit and wait to see what I’m up to. It’s like having a little shadow. I wonder how often we are watched by animals and walk past, oblivious. 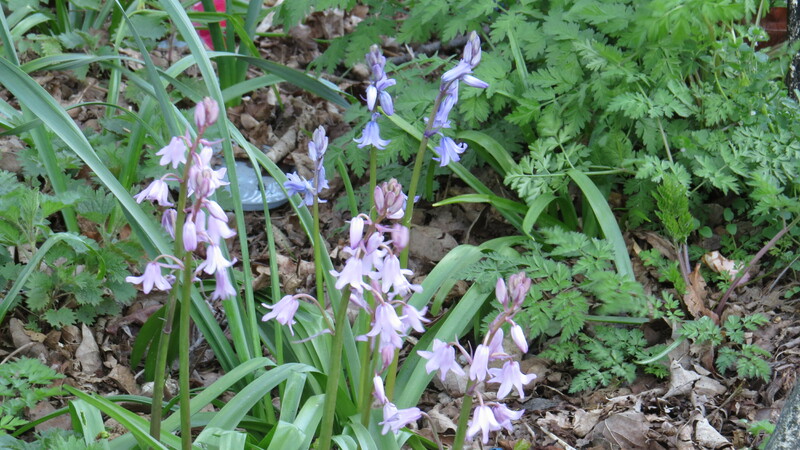 In other news, I promised you a picture of the pink hybrid bluebells in Coldfall Wood, and here they are, with some blue ones for comparison. And the queen buff-tailed bumblebees have been out in force this week, especially in an area of the cemetery which has huge cherry laurels, the size of small trees. This place is sheltered, and the smell of the flowers, like dusty honey, is heavy in the air. 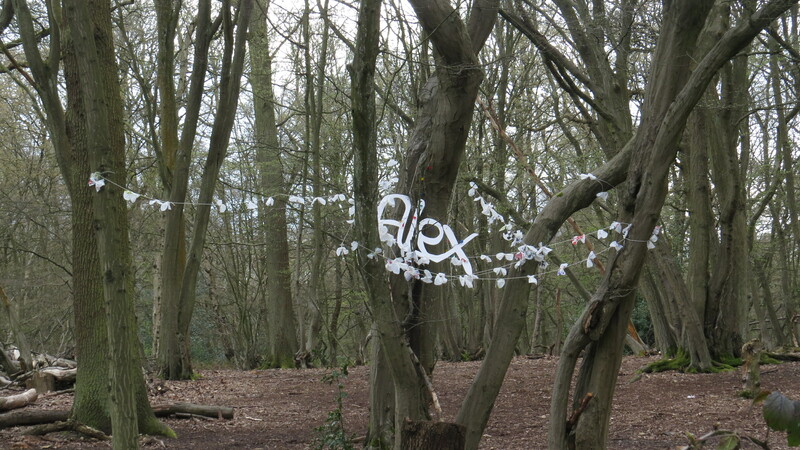 Finally, a most mysterious ‘artwork’ has appeared in Coldfall Wood. Is this to celebrate a birthday, I wonder? It’s rather elegant, I think, though how long it will survive the elements is an open question. 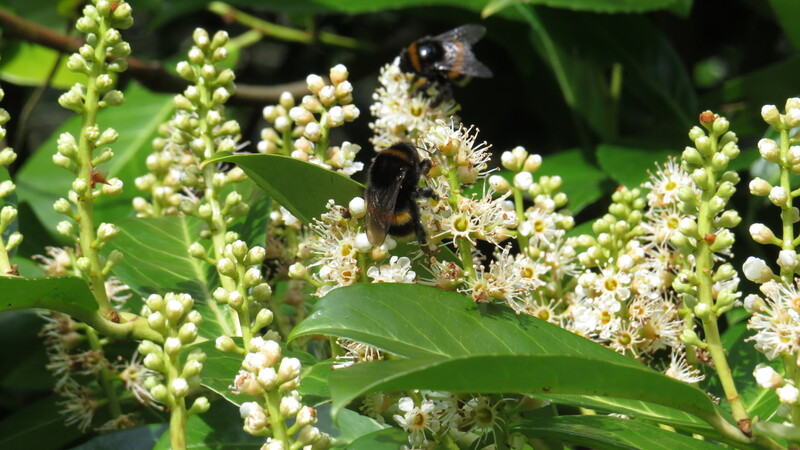 This entry was posted in London Mammals, London Places, London Plants on April 9, 2016 by Bug Woman. Glad to read the fox seems a bit better. Keep up the good work! The fox does seem furrier, it’s as if there is a lot of fine fuzz growing. It reminds me of when my dogs or cats regrow their fur after being shaved for an operation. Fingers crossed! If only you could work the same magic with a vaccine for badgers…. Your story of the fox is becoming a real “page turner”. So many serendipitous comminglings and crossings of paths by you, “B”, fox 1 and now, fox 2, even the Dog unit chap, have all made for a truly marvelous tale. 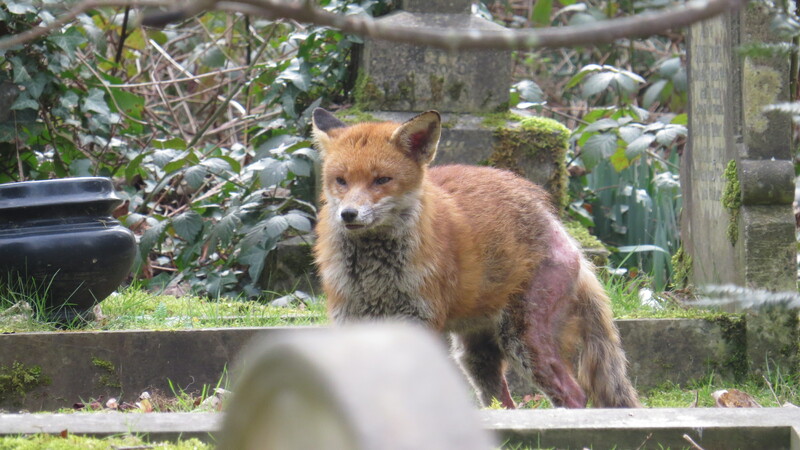 Hope those “high teas” will do the trick for the suffering fox, who does look a bit more hairy, I think. That looks like an improvement to me. So good that several people are working towards the same compassionate goal. 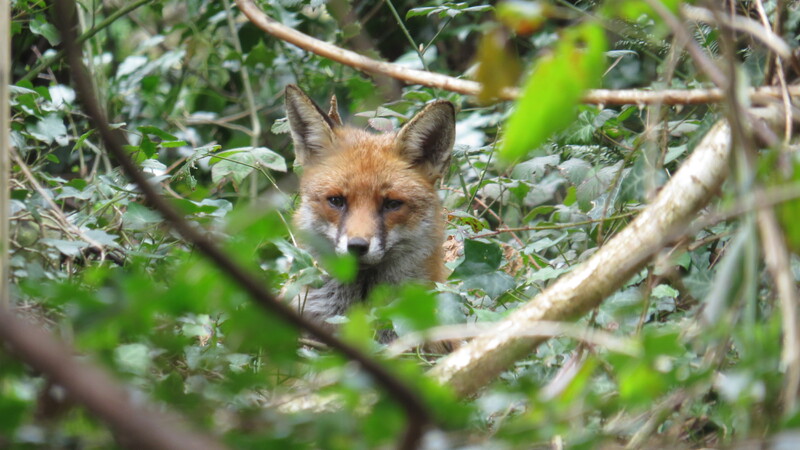 The medicine laced teas seem to be doing the trick…he does look different a better red colour, more furry and smiley faced and less gaunt…you are doing a brilliant job and thanks for the foxy update! The fox does look improved — great job!